My daily encounters with technology… well, as I’m an infrastructure architect who (mostly) works with Microsoft products, that would explain the volume of Microsoft stuff around here… but in order to be credible (and retain some objectivity) when I’m talking about Microsoft products, I’m also interested in what their competitors are doing. That’s why I’m also a Mac user and I dabble with Linux from time to time; my website uses an open source CMS (WordPress), running on Linux, Apache, MySQL and PHP (classic LAMP); I keep an eye on what VMware is up to; and, as well as using a bunch of Google products on the web I recently started using Google Apps for e-mail, calendar and contacts. Since the Microsoft-Yahoo! merger-that-wasn’t, I’ve become increasingly interested in Microsoft’s online offerings and consequently I’m also watching the dominant force in Internet search as they expand into other areas online – that’s why I spent today at the Google Developer Day 2008. Aside from being an opportunity to visit the new Wembley Stadium (I do think they should have incorporated the iconic twin towers from the old stadium somewhere in the new structure), it’s a chance for me to find out a little about the technologies that Google is pushing right now. I feel a bit of a fraud as I’m not really a developer but I answered the registration form truthfully and Google accepted me here, so I guess that’s OK! [08.20] Right from the off, it’s been a positive experience. After arriving at the venue almost an hour before registration was due to commence, I was allowed in, invited to have a coffee and some breakfast, and a really helpful guy went and found me my delegate badge. Now I’m sitting here enjoying the free Wi-Fi (and grabbing one of the few seats that’s situated next to a floorbox so I can keep my notebook PC’s battery charged during the keynote). [8.55] As I sat in the “Space Invaders” room waiting for the keynote session to begin, I was thinking that nnly Google would name the session rooms after classic computer games. Now it all makes sense… I just heard that the keynote will include the first public demo of the Android phone! [9.10] Someone just changed the SSID on the Wi-Fi and I lost my connection mid-post… arghhh! A little green man… hang on… he’s removed his head – what’s he doing inside my Mac? (It’s OK, he’s just giving me a copy of all the materials I might need to make the most of today). [09:59] What can’t Microsoft events be this much fun? [10:25] This keynote has lots of slides, few words, lots of pictures. I like it. Whatever the opposite of death by PowerPoint is, this is it. [10:30] Mike Jennings is performing the first European demo of Android – the open source mobile stack. Making the client more powerful. Making the cloud more accessible. Gears is a browser plugin to enable web application functionality that was previously only available on the desktop. Google has two types of API – the various data APIs and those which provide AJAX functionality – both are designed to make Google services programmatically accessible. Google App Engine allows organisation to run their application on the Google infrastructure in an attempt to overcome the financial and administrative hurdles associated with traditional computing. Android provides a mobile application stack. OpenSocial provides a family of APIs for connecting social websites. [11:50] 35 minutes to go and the Q&A is getting hard for the presenter… what’s interesting to me is that this Google-led presentation has degenerated into a group of developers and users feeding back to Google on things like security, usability, and other common considerations for mobile application development that don’t seem to have been considered. Some of the questions are tough… but that should be expected given the forum. [12:00] He’s desperate to end this session (twice now he’s asked how much longer to go on for…). Poor guy – I feel really sorry for him the way this session has gone but there was nothing here that shouldn’t have been expected. Hopefully Google has a better idea of the state of the mobile market than this session would indicate. [12:05] There’s a guy on the front row writing a book: Professional Android Application Development (to be published by Wrox with a November 2008 release date). Based on a poll of the room, around 50% of people have more than one mobile handset; 25% of people have no land-line at home; and there was no-one here that does not have a mobile. This should be caveated heavily – this was a room full of geeks – but it is nevertheless an interesting study. Android is an open mobile handset project: an open development model; open to the industry (free to carriers/manufacturers/enthusiasts); open to the developer with the ability to integrate at a deep level in the stack (e.g. replacing the dialler). The Android runtime environment is implemented in Java running on a Linux kernel. Some classes are unavailable (i.e. those that are not relevant to mobile computing). Android should be expected during the 4th quarter of 2008. Google appears unprepared for the questions that will be asked of any new platform around security, usability, upgradability – over even why people will choice Android over more established competition. Maybe they are prepared but to quote Mike Jennings, “these kind of questions are over my pay grade”. [12:25] Ooo! Curly Wurlys on the snack table! [12:35] In this session Aaron Boodman will be talking talking about Google Gears… let’s hope that he is allowed to say more than Mike Jennings was. Gears is now a year old and has dropped its Google prefix. Gears is not just about offline access to web applications although the initial implementation was about a database, local server and worker pool. APIs include desktop shortcuts, file system, binary object access and geolocation. [13:15] I’ve just managed to sneak a quick peak outside at the stadium itself – it’s very impressive. We’ve been asked not to use any photos that identify Wembley Stadium for commercial purposes but this is just a personal snapshot (actually, it’s five of them, stitched together in Photoshop CS3). 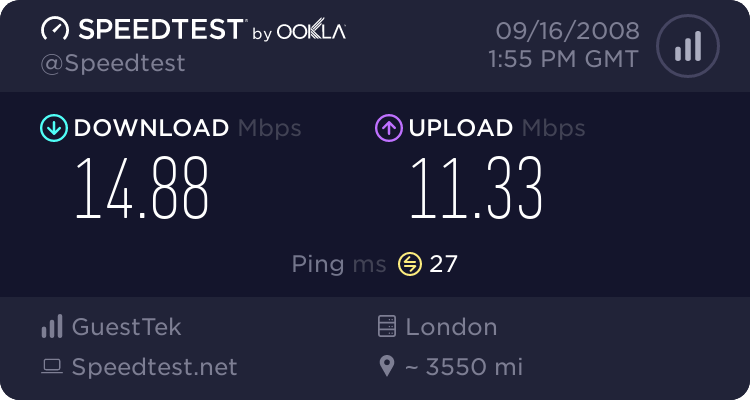 [14:50] I thought that my web access was fast here… I just ran a speed test and I’m getting about 14Mbps! This is the best Internet access I’ve ever had at a conference. [14:55] Looking around the delegates it seems that Macs are pretty common among developers who follow Google technologies! I reckon I’ve seen 2-3 MacBooks for every PC laptop here today (and several of the PCs I saw were running Linux)… as someone who lives primarily in the Microsoft world, this is an interesting experience. [15:00] Ryan Boyd is just starting to talk about mashing up Google APIs… hopefully I can keep up! AtomPub is used to define feeds (mostly for blog syndication), made up of entries containing additional information. Four methods are applied to feeds (create, retrieve, update, delete) and these relate to the equivalent HTTP communications (post, get, put, delete). Standard HTTP status codes are returned. Authentication (client login with username and password, AuthSub or OAuth). Alternate output formats for non-Atom data (e.g. RSS, KML, JSON). The OAuth Playground is a good place to understand how OAuth authentication works – AuthSub is similar in some ways and has been around longer but OAuth is a standardised implementation and should grow over time. [16:20] My little green man now has some blue and red playmates. [16:50] And I’ve never seen as many stickers on PCs as I have today… maybe that’s a dev thing too?! Browser quirks are no longer a problem – GWT handles these for all supported browsers. GWT adds history support to AJAX applications with its implementation of really simple history (RSH). GWT enables code reuse through design patterns. Faster application development is accommodated using IDEs such as Eclipse and other Java tools bust specifically, GWT allows for debugging in bytecode. [17:20] Just swapped my evaluation form for a t-shirt… my kids will love the Google icons on the front! [17:50] Look! A Googler – complete with lab-coat! [17:55] And the fun continues… with giant Chess, Connect 4, Jenga, arcade games (including Pacman and Space Invaders), Mega Blocks… and… somewhat bizarrely, a PHP Elephant! [18:15] Whilst chatting with Tim Anderson, he made a very valid point that I hadn’t considered whilst I was getting excited about technology – Google is an advertising company and, unlike Microsoft or any of the other vendors that I enjoy a relationship with, they don’t need to sell software – they just want people to use their search, etc. and if their vision of the web continues to develop the ad revenues should keep on rolling in too. [18:20] Just looked out of the window and saw that the turf is slowly returning to Wembley’s pitch. Only about a quarter missing now! [18:35] Now that is a good use for the presentation projectors… Wii Sports/Guitar Hero II! [20:00] I really should head home now! I’ve really enjoyed this event – a fantastic opportunity to learn more about Google’s developer tools and APIs and, who knows, I may even get around to implementing some of them here (if this site ever gets its long awaited AJAX overhaul). From chatting with the event organisers, I learned that this was the second annual Google Developer Day in the UK and there were just over 500 people here today. Google is looking to run more events as their portfolio expands – possibly even some smaller, more focused, events but, for me, this was the perfect balance between a conference (for which my employer is unlikely to support attendance, based on recent experience) and the shorter events – providing a small amount of information on a wide variety of topics. Hopefully I’ll be at next years GDD too. As for the Microsoft posts… normal service will be resumed at 9am tomorrow. I was also at GDD London 2008 day, it was a great day, I was one of the sub-notebook people on a Nokia N810, an you’ve given a pretty good overview of the day. Maybe after GDD 2009 you’ll be off MS posts for.. ohh.. a couple of days :). The videos from Google Developer Day 2008 London are starting to go online. Keynote is up. More to follow. Well, thanks for posing there Chewy ;-) It seemed odd to ask you for a picture but the lab coat was just perfect! great write up of the day – a really good summary. I was also in the “mobile operators are bastards” Android presentation, and agree very much with your comments. I do hope that Google have a strategy for working with the operators and incentivising them to make Android a success. It’s looking like a great platform, but I think whether or not it succeeds is going to depend on building a good partnership between the operators, developers and Google. I’ll look out for you at next years GDD! Wow, it looks like the sessions I went to were just crap. App Engine was horrible. Gears is the only session where I agree with you. I think overall, Google was light on the technical content. I regret not going to the GWT session after reading your post. I know some would argue that I have a Microsoft bias, but you just can’t compare the technical content that Google puts out to Microsoft conferences like TechED or PDC. It’s difficult for you to be unbiased (given where your salary comes from) and likewise my relationship with Microsoft means I may not be as objective as I’d like but overall (with the exception of the Android session) I don’t think the technical content of the sessions I attended was any better or worse than a Microsoft level 200 (and even some 300) talks (ask James O’Neill and he’ll tell you that I’ve been pretty critical of some Microsoft sessions in the past too!). Comparing this with TechEd is not a straight comparison – try comparing it to some of the MSDN/TechNet events and you’ll find that Microsoft is better at sticking to the given time slot (i.e. using the full 75 minutes) and at dealing with audience Q&A but I’d also argue that the level of detail is broadly similar. There’s something else to remember here too: Microsoft is a software company – and everyone in the UK subsidiary is either in support, or in sales and marketing – your goal is to sell software (and to make sure customers keep coming back for more); Google, on the other hand, is an advertising company – they just want us to use their software so that we also use their search… on that basis, any buzz that they create from their fledgling annual events is good. As you said… looks like you picked the wrong sessions!